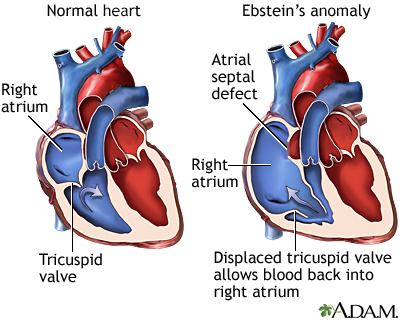 Ebstein anomaly is a rare heart defect in which parts of the tricuspid valve are abnormal. The tricuspid valve separates the right lower heart chamber (right ventricle) from the right upper heart chamber (right atrium). In Ebstein anomaly, the positioning of the tricuspid valve and how it functions to separate the two chambers is abnormal. The condition is congenital, which means it is present at birth. In people with Ebstein anomaly, the leaflets are placed deeper into the right ventricle instead of the normal position. The leaflets are often larger than normal. The defect most often causes the valve to work poorly, and blood may go the wrong way. Instead of flowing out to the lungs, the blood flows back into the right atrium. The backup of blood flow can lead to heart enlargement and fluid buildup in the body. There may also be narrowing of the valve that leads to the lungs (pulmonary valve). In many cases, people also have a hole in the wall separating the heart's two upper chambers (atrial septal defect) and blood flow across this hole may cause oxygen-poor blood to go to the body. This can cause cyanosis, a blue tint to the skin caused by oxygen-poor blood. Ebstein anomaly occurs as a baby develops in the womb. The exact cause is unknown. The use of certain drugs (such as lithium or benzodiazepines) during pregnancy may play a role. The condition is rare. It is more common in white people. The abnormality can be slight or very severe. Therefore, the symptoms can also range from mild to very severe. Symptoms can develop soon after birth, and can include bluish-colored lips and nails due to low blood oxygen levels. In severe cases, the baby appears very sick and has trouble breathing. In mild cases, the affected person may be asymptomatic for many years, sometimes even permanently. Newborns who have a severe leakage across the tricuspid valve will have a very low level of oxygen in their blood and significant heart enlargement. The health care provider may hear abnormal heart sounds, such as a murmur, when listening to the chest with a stethoscope. Medications to help with heart failure, such as diuretics. Oxygen and other breathing support. Surgery to correct the valve. Replacement of the tricuspid valve. This may be needed for children who continue to worsen or who have more serious complications. Some people may have either no symptoms or very mild symptoms. Others may worsen over time, developing blue coloring (cyanosis), heart failure, heart block, or dangerous heart rhythms. Call your provider if your child develops symptoms of this condition. Get medical attention right away if breathing problems occur. There is no known prevention, other than talking with your provider before a pregnancy if you are taking medicines that are thought to be related to developing this disease. You may be able to prevent some of the complications of the disease. For example, taking antibiotics before dental surgery may help prevent endocarditis. Bhatt AB, Foster E, Kuehl K, et al. Congenital heart disease in the older adult: a scientific statement from the American Heart Association. Circulation. 2015;131(21):1884-1931. PMID: 25896865 www.ncbi.nlm.nih.gov/pubmed/25896865. Warnes CA, Williams RG, Bashore TM, Child JS, et al. ACC/AHA 2008 guidelines for the management of adults with congenital heart disease: a report of the American College of Cardiology/American Heart Association Task Force on practice guidelines (writing committee to develop guidelines on the management of adults with congenital heart disease). Circulation. 2008;118(23):e714-e833. PMID: 18997169 www.ncbi.nlm.nih.gov/pubmed/18997169.